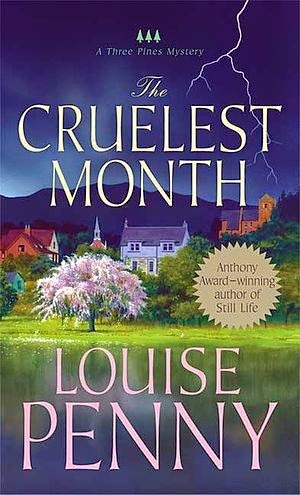 WOUNDED BIRD: LOUISE PENNY - "THE CRUELEST MONTH"
LOUISE PENNY - "THE CRUELEST MONTH"
Spoiler alert! If you have not read the third in the Chief Inspector Gamache mystery series, you may want to stop reading now. I don't reveal the identity of the murderer, but I write more than you may wish to know. Louise Penny writes well, and I enjoyed the third book in the Chief Inspector Gamache mystery series, with exceptions. Had I not read Penny's two earlier books, Still Life and A Fatal Grace, I probably would have been puzzled by the side story of Chief Inspector Gamache's difficulties with his employer, the Sûreté du Québec. Despite Penny's formidable writing gifts, her attempt to squeeze the two stories into one book seems less than successful to me. Am I alone in thinking a mystery novel, even one that is part of a series, should stand on its own? Even if characters in the series recur, the reader should be able to pick up any of the novels and read and enjoy. Once again, the setting is Three Pines, the tiny, out-of-the-way, beautiful, and peaceful village - well, maybe not so peaceful, as murder is in the offing yet again. With another murder in the same setting, the story crossed the boundary of my ability to suspend disbelief. As I read the beginning of the book, I was much preoccupied thinking, "I can't believe this. Another murder in Three Pines." To detract further from the credibility of the story, with a visiting witch in tow, the villagers decide to hold a séance, just for fun, in the village "haunted" house, where terrifying events took place in the earlier mysteries, and - all too predictably - one of their group is murdered. Except for the distracting side story, I enjoyed the middle of the book. Alas, near the end, at the climax of the story, Gamache hopes to solve the murder - incredibly! - by gathering the villagers and returning to the "haunted" house where predictable mayhem takes place before the murder is solved. I wanted to like the book more than I did, because Penny is a skilled writer who creates characters that come to life, and she has a gift for realistic dialogue. The plot is the problem. The introduction of the side story, which doesn't mesh with the main story, the setting of yet another murder in the small village, and the return to predictable murder and mayhem in the "haunted" house stretched credibility beyond what was acceptable to me. I started with one of the middle books Beautiful Mystery. I think her series is more like a saga - -the individual books need to be read for the whole story. I suppose that is not as satisfactory as single stand alone but love the character development. I've never known a mystery series quite like it, and I'm a great fan of mysteries. I've read all or most of the works of P D James, Colin Dexter, Dorothy Sayers, Ngaio Marsh, Margery Allingham, Agatha Christie, and a couple of other writers. Maybe I will adjust to Louise Penny's ways. It seems to me there should be a note on the books to start with the first in the series. Agents Lemieux and Nichol changed so quickly and surprisingly that I couldn't call it character development. The botched raid on the factory? Have I forgotten that incident in the book?